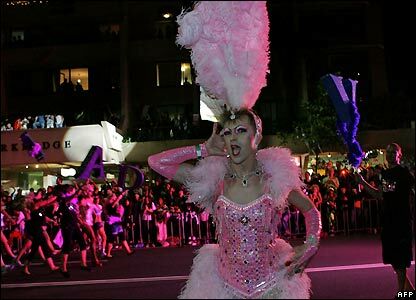 Around 300,000 spectators have turned out to watch the 30th annual gay and lesbian Mardi Gras parade through central Sydney. 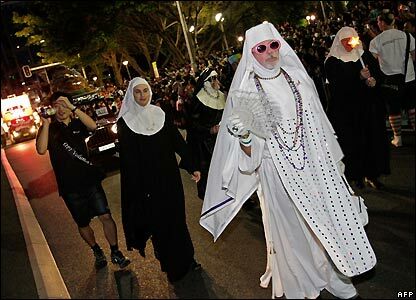 The first parade, in 1978, was attended by 1,500 people protesting against state laws banning homosexual acts. It ended in clashes with police and 50 arrests. Nearly 10,000 people participated in this year's parade, making it the largest ever. 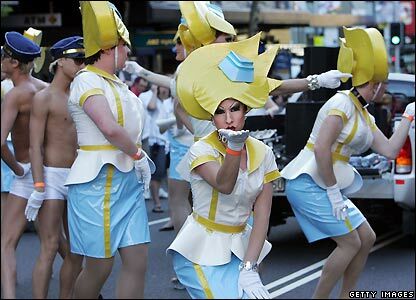 Around 150 themed floats, including moving dance floors, helped make up the 4km (2.5 miles) procession down Sydney's Oxford Street. 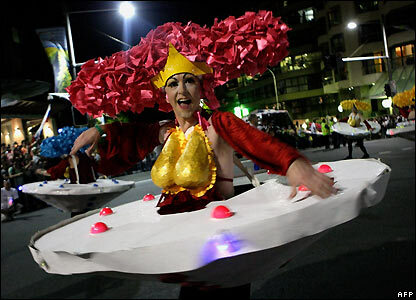 The Sydney Mardi Gras has become one of the world's largest and most flamboyant demonstrations of gay pride. The parade has become increasingly mainstream with people joining the party from as far as the United States and Europe. Anti-homosexual laws have been banned throughout Australia but some violence against gays and lesbians continues, including in largely gay-friendly Sydney.